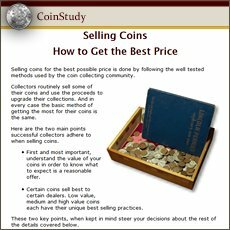 How high are US coin values? The range starts with old "wheat" pennies worth 2 cents each and expands to the elite rarities selling at auction in the millions of dollars. In between these extreme values are countless treasures found in boxes of old coins. Following is a value chart listing the US coin series and their minimum values for each type. This mobile guide represents what the common dates within each series are worth. Above are wholesale values. If your coin is wholesome and conservatively graded these represent what you expect to receive when selling. Discover the common to rare US penny values. Old half cents and large cents date back to very different times and are becoming scarce. Collectors are willing to pay large presidiums for coins in nice condition. Indian pennies, now a very old coin are as popular as ever. As new collections are started the demand increases yearly. Wheat pennies, always a popular and collected series their values keep marching upwards. Lincoln pennies are not for kids any more with values to prove it. Have a look through your old nickels. It is a series of American coinage with a huge following of collectors forming a solid base to their values. With a large variety of designs, nickels are always popular. The older Shield and now the Liberty "V" nickels are gaining in status. With over two hundred years of US dime production and literally hundreds of date and mintmark combinations. Examine closely these small potential treasures. Bust dimes are all historically important, Seated Liberty dimes are now highly sought and both series are experiencing pricing gains due to popularity. Find an old silver quarter in your box and the pace to higher values quickens. If your coin is older than a Washington quarter many collectors are very interested in adding it to their collection. Bust quarters, the earliest US quarter minted are scarce, followed closely by the Seated Liberty series in rarity. Although many rare dates and varieties are an important part of US quarter values, often it's the condition of your coin that really sets apart what it is worth. Value charts for each series list each date and further separate values depending on the amount of wear. Follow the above image link to in-depth grading guide to your coins. An accurate US coin value is determined by the combination of date, the mint that produced the coin and condition. All is covered within each series of half dollars. Silver dollars are Popular, Popular, Popular. The entire group, Morgan, Peace, Seated and Bust dollars, are all valuable. A large and majestic coin, inspect yours carefully. Your box of old coins if it yields an old silver dollar, for example an old Morgan dollar is valued at a minimum of $18.09 . Each coin is close to one ounce of silver, finding a few easily adds up to over $100. Peace dollars another likely coin to find is of similar minimum value. Each of your coins must be judged individually as to date, mint that struck the coin and its condition. An American numismatic treasure, gold coins are one of the most popular of collectibles. Who doesn't want to own a US gold coin? Gold coins are scarce, most are rare, and all US gold coin values are climbing higher. Many collectors specialize in assembling gold coin collections and the demand they place on these scarce coins is huge. Values have risen yearly. All US gold coins are heavy with the precious metal forming a solid base to their values. Add to this minimum value the collectible factor, plus their true rarity, and you have a coin that needs careful examination to determine an accurate value. Follow the image link above to these unusual denominations of US coins. Values are surprising, especially if your coin is above average condition. Your Half dime value has quietly and steadily advanced in price. Scarce today, these small silver coins are sought by dedicated collectors and dealers. Return to... Coin Values Discovery, the main index for more insight into US Coin Values. Value charts, grading images and descriptions to judge condition, all to uncover your box of old coin value. Prepare your coins for selling, find coin buyers and understand their true potential.